Whether you’re a total yoga beginner, a seasoned yogi who is new to yin yoga, or an experienced yin practitioner, there is something for everyone in this eight-hour course. In yin yoga there is time…lots of time: time to explore sensations, time to learn the appropriate depth for you in each posture, time to develop the habits of attending, noticing, and making appropriate decisions. This is one reason that yin yoga is so beneficial: You are provided time to get to know your body, what it needs and what it does not need. Yin yoga explores the edges where resistance arises: This resistance may be physical, but there are other edges to become aware of as well-emotional and psychological edges are also to be noticed and honored. Even though Sarah Powers coined the term “yin yoga” in the late 1990s, the idea of holding a posture for a long period of time has been around since the advent of hatha yoga. 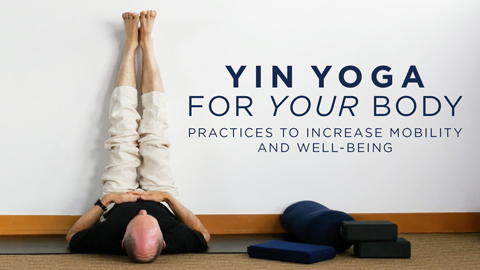 It has also been used in sports, dance, martial arts, and gymnastics training for centuries, but it was Bernie’s teacher, Paul Grilley, who recognized a complete class could be structured around yin principles. This course is designed to introduce you to the concepts behind yin yoga and to provide an opportunity to balance both the yin and yang aspects of your practice. Below are two bonus videos that we hope you will enjoy.